Disney is dabbling in transmedia for Tron with comic books, and different videogame titles filling in the story of Flynn's Grid. Like many of you, I loved the original Tron film from 1982 and was super excited to hear that a sequel was being made starring Jeff Bridges as an older Kevin Flynn. Tron Legacy takes place in the present day, and a lot has happened in the 28 years since the original. Rather than glossing over all of that history, and simply licensing a crappy movie tie-in videogame, Disney decided to make the videogames and comics to fill in the gaps of the Tron timeline. The really interesting part is that each piece tells a different story: the comic series, Betrayal dramatizes events soon after the original film and deals with Flynn's split responsibilities, while the cartoonish Wii title Tron: Evolution Battle Grids continues into the late 80s with its focus on competitive play. The big AAA game coming out for Xbox 360 and PS3 on December 7th is called Tron: Evolution and it tells a three act story of a utopia on the Grid falling into disarray from 1990 to the year 2000. "We decided to do something a little bit different with the Evolution series in that we actually wanted to tell events that happen across the Grid between 1982 and 2010," Chris Whiteside, the Design Director at Propaganda games. "It's part of Disney's big transmedia play that they are trying to do with Tron. It's not just about the films, there's so many other ways of using storytelling to bring Tron to new audiences. "It was clear that a game was going to come with the film but we were very conscious of the fact that we didn't want to make a 'movie' game," Whiteside continued. 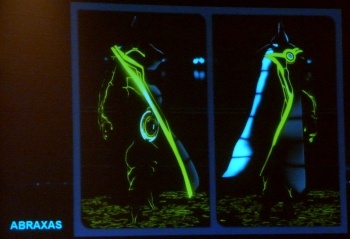 The screens and details provided for Tron: Evolution certainly don't feel like it's a cheap movie tie-in. The main character in Tron: Evolution is called Anon, which is short for anonymous, and his look is very non-descript because the designers wanted the players to be able to customize his look and feel like it was their story. In Evolution you are sent by the security program Tron to investigate the appearance of viruses in the system. The whole idea of a virus is anathema to Flynn's Grid because it exists separate from the internet, so it's a mystery as to how a virus would infect it at all. The viruses seem to all have yellow circuitry, and Whiteside made sure to tell us that color is very important to the universe of Tron. Well, duh, anyone who's seen the original film lets out a cheer when the Grid goes from red to blue after the demise of the MCP. Whiteside had a hard time discussing too many details of the games without spoiling anything but I was able to glean some information about the plot. Over the course of Evolution, Tron city deteriorates from a pleasant place to a downright slum, setting the stage for the bleakness of the Legacy film. Olivia Wilde plays Quorra in Legacy but she also appears as a helper to Anon in Evolution. A major villain of the game is called Abraxas and he is a very powerful program. From his yellow circuitry, one could deduce that he was a virus or perhaps working with Clu 2. The graphic novels dramatize the events soon after the defeat of the Master Control Program in Tron. Flynn is able to create a smoothly working Grid, with the program Tron as his chief of security. But Flynn must be in two places at once, so he creates another version of himself which is a copy of the Clu program in the 1982 film. "We pick up almost exactly where the original film drops off," said Nachie Castro, editor at Disney Press who is publishing the graphic novel and comic series. "We've got Kevin Flynn, who is just dabbling in what will eventually become the Grid and bringing some of the key characters from both Legacy and the Evolution games to the floor. We're getting reintroduced to Tron and we're basically seeing the birth of Clu ." Castro couldn't give away too many spoliers, upon threat of the chip embedded in his molars electronically shocking him to silence at the studio head's command. As a huge fan of Tron, I was extremely interested in learning more about the sequel at New York Comic Con but I was disappointed to learn that the panel only concerned the game tie-ins. I shouldn't have been; I was interested in what the transmedia team had to say almost immediately. The sheer amount of thought and planning that has gone into Tron: Evolution and the graphic novel Tron: Betrayal in expanding the Tron universe and story is really exciting. Let's hope that it all pans out and the games actually end up being as cool as I'm sure the movie will be.